The Muslim community must be made to realise that it’s intolerance to customs, practices and food habits and sensitivities of the majority community in the country they live in cannot pass anymore. 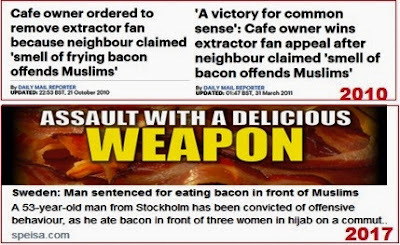 Limitless Muslim migration to Sweden, Holland, Germany and others has wreaked havoc in these countries with intolerance, rapes, murders, ghettos and no-go zones and terrorism. Many of them in the last decade came as REFUGEES. respect the sentiments of the majority and their values. Failing this, the offenders will lose all citizenship rights”. Just recently we had riots in Noida over a fake case of a maid being kept captive. The riots were by illegal Banglas working in that area and had built illegal shanties nearby. 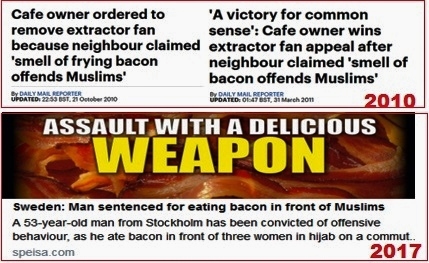 It’s hard to believe that these illegals, from the Muslim community can go to such extent of violence. After the incident, the colonies in the locality have banned the employment of any Bangla. Why do people employ people without proper police verification in states like UP or Delhi is something to ponder? So, who are these Rohingyas? They are a minority within the State of Myanmar and number around a million from the Rakhine region. After a long history going back to the Indian subcontinent, they were considered an ethnic group in then Burma and now Myanmar. Over period they were deprived of normal citizen and political rights. Consequently, they have been fighting for secession from Myanmar and have a military wing with multiple denominations – one is called The Rohingya National Army and another very violent wing is called the Arakan Rohingya Salvation Army (ARSA). ARSA is designated a terrorist group in Myanmar; it is made up of Muslims. In the most recent attack around August 25, the ARSA killed 96, injured many and displaced over 400 people. A majority of these people were Hindus. So, whether it is India, Pakistan, Bangladesh or Myanmar the ones suffering most at the hands of Islamic terrorists are Hindus. Let’s rest that trivial, inevitable truth. 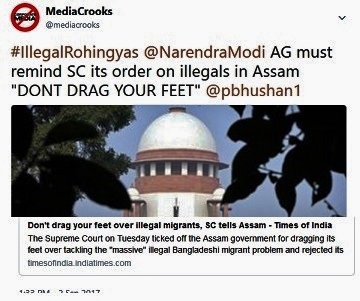 Sickulars in India are now trying to make out the illegally settled Rohingyas as “victims” of Myanmar govt when Rohingyas run terrorist outfits in their own country. This is not India’s problem and should never be. India faces insurgents in multiple states. With all our might, we can drive these Maoist pigs to Burma, Bhutan or Bangladesh or even Pakistan. Do we? The Rohingyas in India may not be militants or terrorists but they do not belong here and especially not in sensitive areas like Jammu that is a target for terrorists and enemies to groom them. Whether Rohingyas or Ching Funglis from Pappu’s Jupiter – once their identity is “Muslim”, the brotherhood will try and groom them to kill Hindus and destroy India. As simple as that. 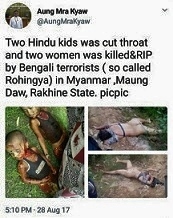 And what the Rohingya killers have done to Hindu kids can be seen in the image on the left. The current BJP govt at the Centre MUST NOT dither and must ensure all the illegals are deported. The older lot from Bangladesh in Assam or Bengal and other places might take longer. But GOI MUST ensure that new lots are not only deported but send a clear warning that those protecting illegals will be prosecuted and action must be initiated quickly. 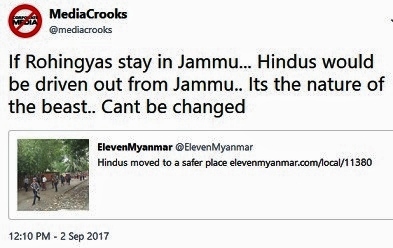 Especially, the first lot of Rohingyas in Jammu must be packed off immediately and then the rest. And sir you have to check out the website Daily opinion. Most Anti Hindu and Anti Modi website I've ever been on. 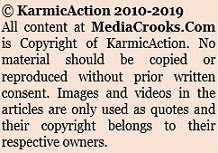 Your mind will be destroyed by the number of media crooks thriving there. Another hard hitting, to the point article. Govt cannot be blind to this religion based problem. In Indian history (even Europe recently), Muslims haven't proven themselves to peacefully Co-exist with majority. Already identified illegal refugees must be thrown out on priority. Then, PMO & HMO need to ensure concentrated Muslim pockets in India are combed & illegal refugees/activities in these pockets are scuttled. It's a shame that even City Police are scared of entering some of these​ concentrated Muslim pockets. And you must read the article by Aakar Patel on how terrible the 'Muslims' must be feeling in India!! Even Muslims would be laughing at this article, but the Toilet paper of India publishes it!! I very much doubt of the PMO or the HMO would focus on such issues and the Police Force is slowly becoming a Boys Scout force! No courage and objectivity. And why Congi, AAP, MIM et all are so worried about good use of biometric based id i.e. AADHAR. Congis never thought Nandan Nilekani tool can be used to deprive congis their corrupt money of pilfered ration, gas, or like and soon they would be horrored to see their vote banks being weaned away. Swatch Bharat is only possible if we don't allow illegal immigrants of any Country. However our own politicians patronise them as vote banks and jeopardize national security. Govt should not only deport illegal immigrants but also take action against anyone who brings them in and also those who employ them. Stop hiring such people for any work. Ask your MP, MLA, corporatist to take action to evict them, if they want your vote. Use social media to educate friends, to do the same. Challenge those who support these illegal immigrants to host them in their homes. Question every "liberal" online how many Rohingyas live in their homes, and if they can marry their daughters or sons to them. Absolutely agree.If the Western countries and Islamic countries are feeling so sorry , please let them adopt them. Its very easy for people standing away from the situation to make benevolent statements.We are not a rich country and have enough poor of our own and we cannot annoy one more neighbour Myanmmar. I fail to understand if they are so marginalised why did they attack the majority(understand a local was raped by Rohingyas which caused this major violence).Even in the height of SL conflict there was no instance of a Tamil group attacking SL women. Why doesn't Saudi flagholder of Sunnis take them in or closer Pakistan? Because these countries only to cause harm in the name of Islam. Sharp, as always. An awesome analysis. That's only the tip of the iceberg. In a couple of years, mooslis will be pouring out of Pakistan because of a Syria like situation. 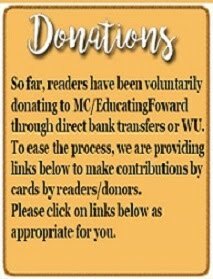 Brace up for that humanitarian crisis. Rahul Gandhi to Visit Silicon Valley to Talk About Artificial Intelligence. Sources said Gandhi wants India to lead in the niche area of Artificial Intelligence which comes after software development, in which India has already won global recognition. Congress vice president Rahul Gandhi is headed to the United States where he is likely to address a gathering on Artificial Intelligence (AI), the science of making machines that think like humans. Gandhi, who recently returned from Norway, is gearing up for another offshore visit, this time to the Silicon Valley in the US to "expand his thoughts about artificial intelligence", party sources said. They said he might speak on the issue on September 11, after meeting technology experts. The sources said Gandhi wants India to lead in the niche area which comes after software development, in which India has already won global recognition. While AI is still a nascent subject to most in India, many countries including China have begun investments in the area to strengthen research in it. A senior Congress leader said the idea was to bring back knowledge and implement it at the policy level in the Congress party's vision documents. Facilitating Gandhi's US visit is the chairman of Overseas Congress, Sam Pitroda, a technology innovator who was brought back to India by Rajiv Gandhi and was among those behind the telecom revolution in the country. The Congress VP had met leaders in the field of biotechnology during his Norway visit. He is currently grappling with the party's sliding electoral graph after a series of defeats. The party is weighed down by anti-incumbency sentiments and infighting in the state unit in Himachal Pradesh. In Gujarat, where elections are slated to be held later this year, it lost a veteran when party leader and former chief minister Shankarsinh Vaghela walked out of the Congress. Ravinar suggests that during partition, we should have required that Muslims choosing to settle in India must respect sentiment of Hindu majority. Actually, at that time without such requirement, Muslims were very accommodating, polite and docile. But as is their nature and we see that in many European countries, once they get established, they show their true color. Who ever heard in fifties that Muslims in India refused to sing Vande Mataram? Or give us fifteen minutes without police... etc? The only solution is to find a final solution for Islam. Clarion call is to kill this 'Bhasmasura' before it kills you. I believe she writes for NYT and like a true parasite she writes books about India and makes money.. I was thinking, “God save our country|.. At any cost (I mean democratically), we should never let the Congi /Commie /Secular scumbags come to power for the next 10 years at least. I really hope all these Rohingyas are sent back to where they came from ie., Myanmar.. It is not clear as to why the examination should be different for students coming from different streams, i.e. different for regular / private / correspondence / distance education stream for the same class of under-graduation / graduation / post-graduation? If common exam is held for students of all streams, results can spring up some surprises – some students from distance education stream (who might score more than the students coming from regular stream) who might have been held in low esteem just for the reason that they are not from regular stream. If results can spring up equal or majority of the rank holders of top 20 ranks occupied by students coming from distance education, it might expose the self-assumed superiority & the noise made out to be as to how the regular students (as also the so called prestigious institutes like Ryan / IIT or even Harvard) are superior to those coming from distance education.